High density poly sheeting. Lightweight, super tape adhesion. For use as a overspray shield, paint drape, or multi-purpose cover. These items are made with three-layer technology. The inside layer is treated with static cling for holding power and the outside layer is like a vacuum that holds paint and dust while having a flake-resistant technology. Clings to any surface. Heavy duty 80 gauge stretch film roll. Made of low density, single wound polyethylene plastic. For use as a overspray shield, paint drape, or multi-purpose cover. Also acts as vapor barrier in construction or home projects. Consumer. Forearm Forklift Stretch Wrap, 60 ga Thickness, 9.9 in Width, 750 ft Length, For protecting Furniture and appliances from scratches and scuffs Replaces storage boxes, tape, twine, strapping and stretch film. Wraps skin tight. No adhesive residue. No unwinding or friction on hand during application. Protects against tarnish, rust, weather, insects, and scratches. Use for moving, storage, girthing and palletizing. Squeeze-it dispenser included. High density poly sheeting. Lightweight, super tape adhesion. For use as a overspray shield, paint drape, or multi-purpose cover. These items are made with three-layer technology. The inside layer is treated with static cling for holding power and the outside layer is like a vacuum that holds paint and dust while having a flake-resistant technology. Clings to any surface. Tough, seamless plastic for tough jobs in construction and agriculture. Building Code Specifications, complies with ASTM D-4397-84. Bulk. Heavy-duty film for a variety of interior and exterior uses. Can be used to seal windows, doors, roofs or use as protection from paint and dust. Consumer. Ideal for making moisture proof indoor storm windows and doors, can be used to cover, protect and store furniture, appliances, machinery and equipment. Bulk Roll. Tough, seamless plastic for tough jobs in construction and agriculture. Full weight with thickness marked on each rigid-core roll to meet Building Code Specifications, complies with ASTM D-4397-84. Bulk. Heavy-duty film for a variety of interior and exterior uses. Can be used to seal windows, doors, roofs or use as protection from paint and dust. Consumer. Tough, seamless plastic for tough jobs in construction and agriculture. Building Code Specifications, complies with ASTM D-4397-84. Bulk. Tough, seamless plastic for tough jobs in construction and agriculture. Building Code Specifications, complies with ASTM D-4397-84. Bulk. Heavy-duty film for a variety of interior and exterior uses. Can be used to seal windows, doors, roofs or use as protection from paint and dust. Consumer. Self-adhering masking film for construction and remodeling jobs; clings to almost any surface; premium film is treated with a unique formula that attracts overspray and reduces flaking; made to withstand multiple uses without making a mess; makes painting easier, cleaner and faster. Color: Clear. Super tough, fully waterproof plastic sheeting used by DIYers and contractors for large and small construction, landscaping, or covering projects. 2-mil works well for light covering jobs, drop cloths, furniture covering, and masking. Black sheeting is sun-resistant and offers longer service outside. Bulk. Super tough, fully waterproof plastic sheeting used by DIYers and contractors for large and small construction, landscaping, or covering projects. 2-mil works well for light covering jobs, drop cloths, furniture covering, and masking. Black sheeting is sun-resistant and offers longer service outside. Bulk. Tough, seamless plastic for tough jobs in construction and agriculture. Building Code Specifications, complies with ASTM D-4397-84. Bulk. Tough, seamless plastic for tough jobs in construction and agriculture. Building Code Specifications, complies with ASTM D-4397-84. Bulk. Standard duty clear stretch film on 3'' core. 18'' x 1500'. High puncture resistance. Great for palletizing. 20mil/70 gauge. Tough, seamless plastic for tough jobs in construction and agriculture. Building Code Specifications, complies with ASTM D-4397-84. Bulk. Tough, seamless plastic for tough jobs in construction and agriculture. Full weight with thickness marked on each rigid-core roll to meet Building Code Specifications, complies with ASTM D-4397-84. Bulk. 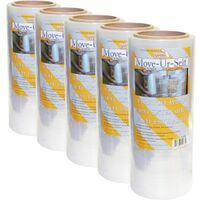 Replaces storage boxes, tape, twine, strapping and stretch film. Wraps skin tight. No adhesive residue. No unwinding or friction on hand during application. Protects against tarnish, rust, weather, insects, and scratches. Use for moving, storage, girthing and palletizing. Squeeze-it dispenser included. Made of low density polyethylene plastic. For use as a overspray shield, paint drape, or multi-purpose cover. Also acts as vapor barrier in construction or home projects. Bulk.